Libya is a hydrocarbon society, one of a small group of countries whose income comes mostly from petroleum. Hydrocarbons provide about 95 percent of Libyan export earnings, 65 percent of GDP, and 96 percent of government revenue (IMF Article IV Consultation 2013). Libya gets its revenue from the taxation of third parties rather than from its citizens, and many of those citizens are unproductive. Revenue is typically produced by foreign labour with foreign technology from a resource that is largely consumed by foreigners. Libya thus had one of the highest per capita GDPs in Africa, because its energy production produced substantial revenue and its population was small. One consequence was that the Gaddafi regime could maintain itself in power with fewer constraints from the demands of its citizens and did not need to seek a consensus on its policies. Little of the national income flows to the lowest economic sectors. The opening of the country to greater foreign direct investment, especially in the energy sector, not only provided opportunities for investors but was also essential for the hydrocarbon industry on which the country depended and which had been undermined by the 2011 revolution. The National Oil Corporation (NOC) set a goal of nearly doubling oil production to 3 million barrels per day by 2012, and the opening of the economy by the removal of sanctions has led to growth. Libya’s GDP per capita in 2010 was USD 14,100, compared to USD 3,477 in 2002, when the embargo was still in place. The end of the command economy has accentuated this process because it is likely to increase opportunities for entrepreneurial activity, and it is expected to stimulate evolution towards a more market-based economy. The service and construction sectors, which account for roughly 20 percent of GDP, have expanded over the past six years and will perhaps make up a larger share of GDP after political and social instability has been overcome. The questions for the future are how to increase the number of Libyans employed by foreign companies and how revenues from the oil and gas sector will be distributed. Libya imports about 75 percent of its food, because its arid climate and poor soils limit agricultural output. Libya’s primary agricultural water source is the Great Man-Made River Project, but significant desalinization capacity will be needed to meet growing water demands. The 2011 revolt affected the economy profoundly. Oil production fell from 1.659 million barrels per day (bpd) in 2010 to 479,000 in 2011. GDP growth declined by 60 percent. Non-oil output growth also declined by 50 percent, due to interrupted economic activities. Approximately 600,000 migrant workers fled Libya during the revolt, making it, at that time, the largest migration crisis since the Kuwait crisis(1991). Food and cash shortages were reported in parts of the country. 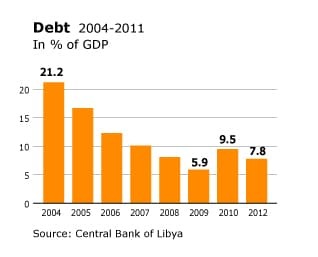 Most of the UN sanctions that froze Libya’s foreign assets (200 percent of 2010 GDP) were lifted on 16 December 2011. In 2012, the economy recovered much more quickly than had been predicted. In 2012 oil production had climbed back to 1.509 million barrels a day, a 215 percent rise since 2011. Natural gas production increased by 54.8 percent in 2012 (BP Review of World Energy). The recovery is projected to continue in 2013. GDP growth was estimated at 121.9 percent (compared with a contraction of 59.7 percent in 2011 and growth of only 3.7 percent in 2010), of which non-hydrocarbon GDP growth was at 30 percent in 2012, driven mainly by reconstruction. Consumer prices increased greatly in 2011 (15.9 percent) but are estimated to have grown at only 3.6 percent in 2012, as imports have resumed. 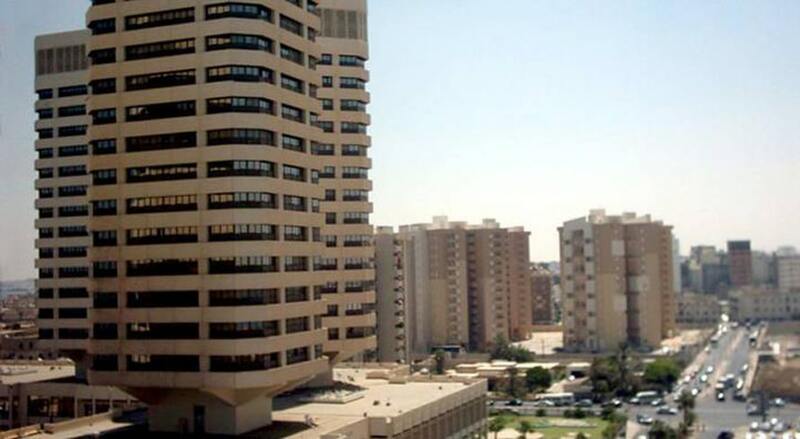 The Libyan Central Bank forecasts GDP growth in 2013 of 16-18 percent (the International Monetary Fund forecasts 20 percent). A large growth in public sector spending has boosted household incomes and consumption, and the non-oil economy grew by 44 percent in 2012, with a forecasted 25 percent growth in 2013. The danger is that popular aspirations unleashed by the revolution will put pressure on public finances and fiscal policy. Current expenditures are ballooning due to higher wage costs and subsidies. In March 2012 the government announced a record-breaking budget, with expenditures reaching 50 percent of GDP. However, the 2012 outcome will depend on whether the Libyan economy is able to absorb the announced current and capital expenditures. Therefore, fiscal expenditures are likely to reach 42 percent of GDP in 2012, and total revenues might reach 40 percent of GDP. A relatively low fiscal deficit would emerge in 2012 (2 percent of GDP), and a surplus could emerge again in 2013 (data from Worldbank.org). The MENA Economic Monitor predicted that the financial deficit and the current account deficit will continue during the year 2016 to reach 60% and 70% from the gross domestic product (GDP) respectively. According to the International Monetary Fund; the GDP per capita in the year 2015 had reached 6277 US dollars, and it is presidency that the Libyan economy will witness a growth at the GDP level with a rate of 13.7% during the year 2017, in comparison with -3.3% and -6.4% in the years 2016 and 2017. The International Monetary Fund predicts that the inflation rate will reach in 2017 to 12.5%, in comparison with 14.2% and 14.1% in the years 2016 and 2015. 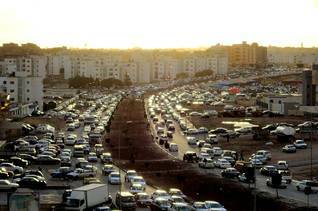 The World Bank predicts that the year growth rate of the Libyan GDP will reach 40% and 20% respectively in the years 2017 and 2018, taking into consideration that the warring sides in Libya had reached a political agreement. The World Bank emphasized the necessity of the stability of the political conditions in the country, and the agreement of the warring sides to form a unity government; which will guarantee the launch of programmes for the reconstruction of the economic and social infrastructures. The internal conflict had formed great pressures on the Libyan economy, which relies heavily on oil and its export; which had led to the receding of the total revenues by 61% in the year 2014. At independence, in 1951, Libya was the poorest independent country on earth, with a per capita annual income of USD 35. 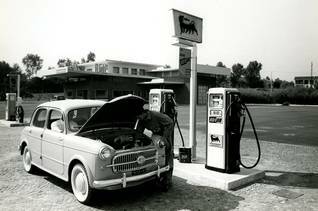 The first concessions for oil exploration were granted in 1956, oil was discovered in 1959, and exports began in 1961. 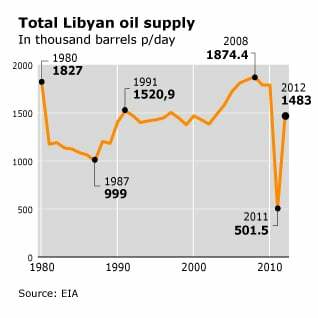 By 1965 Libya was producing 1.22 million barrels a day, which rose to 3.1 million in 1969. This produced a rapid increase in revenue, boosting the economy. Libya became one of the fastest-growing economies in the world. 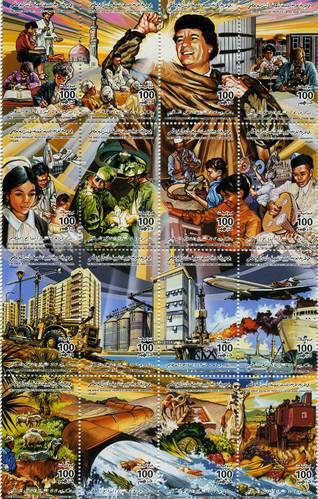 National GDP grew quickly, from 125 million dinars in 1960 to 560 million in 1965 to 1,358 million in 1969. 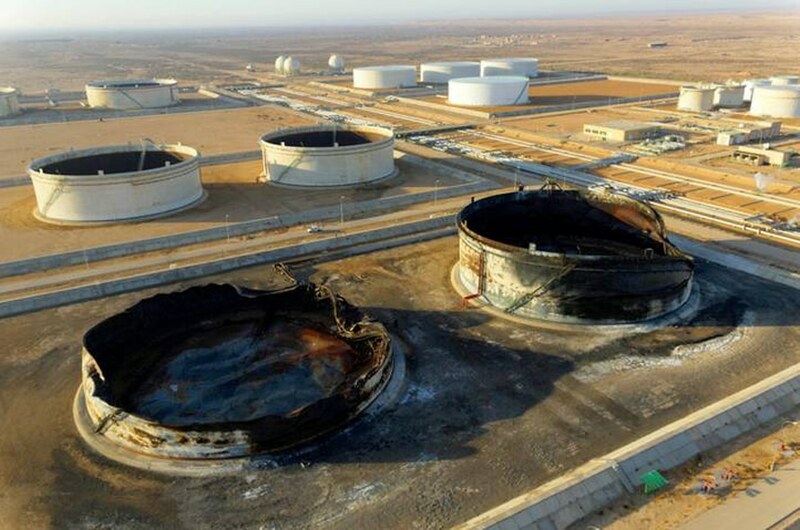 Libya has known oil reserves of 48,000 million barrels, the ninth largest in the world and just under 3 percent of the world’s total reserves. 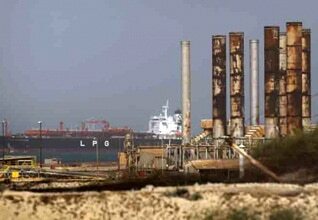 Libyan oil is easy to extract and is close to its major markets in Europe. In order to increase Libyan oil exports, Gaddafi, in 1970, took advantage of the fact that world demand for oil was exceeding supply by playing off the seven major companies – Esso (Exxon), Shell, BP, Gulf, California Standard, Texaco, and Mobil – against independent companies, thus breaking the restraints on production. This coincided with the rise in world oil prices in the 1970s and a general trend in oil-producing countries for the governments to participate in their own production through ‘semi-nationalization’. 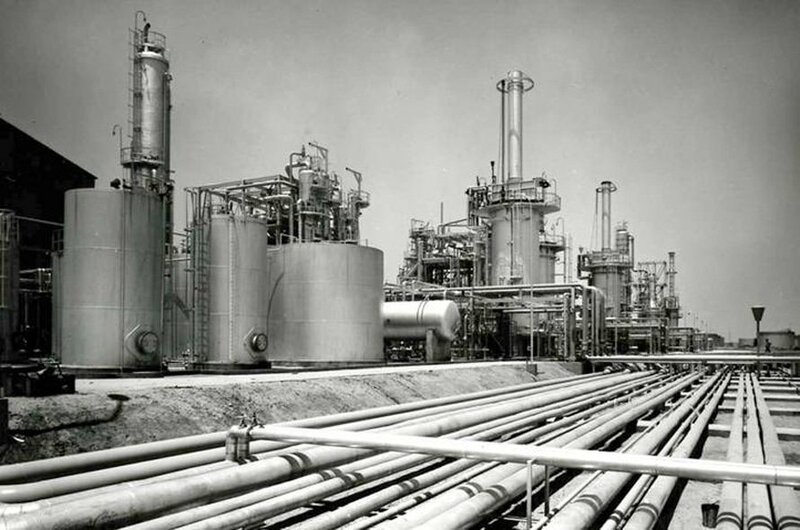 In 1975, the share of the Libyan National Oil Corporation (NOC) in production was increased to 60 percent, but full nationalization was not feasible, because the government depended on the knowledge and expertise of foreign companies in exploitation and production. Gaddafi hoped a developed agricultural sector would counterbalance the dependence on oil. 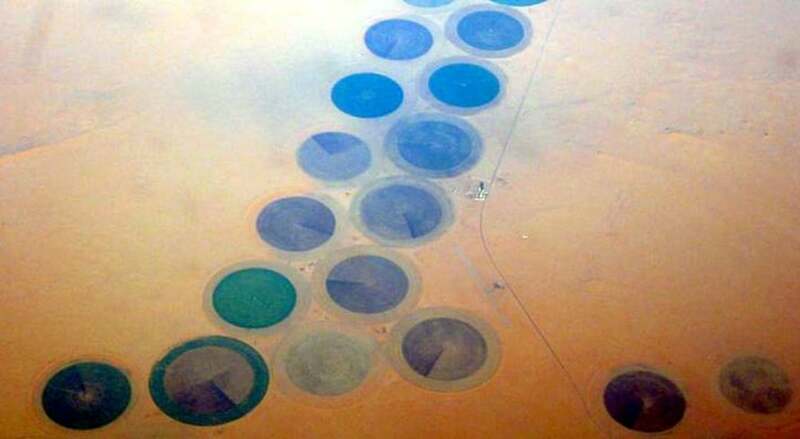 In his early long-range plans, 22 percent of the resources were earmarked for agriculture, but only 5 percent of Libyan soil is suitable for seasonal agriculture and less than 2 percent receives enough precipitation for permanent agriculture. The Bank for Agricultural Development assigned large interest-free loans to purchase agricultural machinery, fertilizers, and seeds, and large-scale farming projects were initiated, such as the Great Man-Made River project and the Kufra irrigation project. The results were disappointing because of the lack of arable land and an experienced labour force. This led to over-exploitation of land and misuse of fertilizers. The development of rural areas was seriously affected by international diplomatic problems. The expulsion of Egyptian workers following the Camp David Agreements in 1978 deprived Libya of its agricultural labour force. The one-house-per-family policy of the government meant that family houses outside towns were occupied by Bedouins and the fields were not maintained. In short, agriculture has long been stagnant. In 1961 agricultural land represented 6.3 of the land surface, and in 2011 it was estimated at 8.9 percent. Over the same period, arable land increased in area from 1,700,000 to 1,750,000 hectares. Libya nowadays depends on imports for 75 percent of its food. About 17 percent of the population works in agriculture, although figures are not precise because a great deal of agricultural work is unrecorded: crops are grown for self-consumption and in cooperative family enterprises. In Jebel Nafusa, for instance, all members of the family participate in the annual olive harvest and in maintaining the groves. Agriculture contributes 3.6 percent of GDP, industry (mainly the hydrocarbon sector) 56.7 percent, and services 39.7 percent (CIA World Fact Book). 17 percent of the labour force works in agriculture, 23 percent in industry, and 59 percent in services. The main products of the agricultural sector are wheat, barley, olives, dates, citrus fruits, vegetables, peanuts, soybeans, and cattle. Although Libya has a Mediterranean coastline of almost 2,000 kilometres with an ancient history of human settlement, there is no strong tradition of fishing and fish consumption in contemporary society. Until recently, much of the artisanal and small trawler fishery was carried on by Italians and Maltese based in Tripoli and a few other major ports, whilst Greeks were especially active in the sponge fishery. Local participation and production levels have undoubtedly increased since the 1970s, and this trend has been strongly encouraged by fisheries authorities, through extensive investments in port and onshore infrastructure and services. In the mid-1980s it was reckoned that the inshore artisanal fleet of wooden small craft (less than 10 metres in length) amounted to no more than 400 vessels and that perhaps as many as 20 stern- or side-trawlers were operational. Annual production in the 1970s and 1980s reportedly ranged from a few thousand to as much as 10,000 tonnes, though a weak data-collection system opens to question the reliability of available statistics. It is believed, in any case, that most production from Libyan waters in previous years was accounted for by unlicensed foreign vessels. The apparent growth in the artisanal fleet has been remarkable, with total units presently numbering almost 3,500. The industrial fleet has also undergone significant expansion, with some 90 units – trawlers and a few purse seiners and long-liners – now based in domestic ports. Production, too, has shown a significant rise in recent years, according to official figures. In 1994 the total catch was reported to stand at about 33,000 tonnes. It can be estimated, on the basis of the 1993 coastal fisheries survey, that artisanal production provides direct full-time or part-time employment for about 4,500 small-craft owners and crew and about 5,000 mostly part-time fishers working along shore with hook-and-line, gillnet, castnet, and hand collection. A current workforce of roughly 150 is estimated for the industrial fishing sector. Secondary sector employment in servicing and support activities at major landing sites is reckoned to involve about 250–300 part-time and full-time people. The post-harvest industry is estimated to provide direct employment, both permanent and seasonal, for some 2,000 processing-plant workers, fish merchants, and technical personnel. With a primary and secondary productive employment base of about 12,000 people, the fisheries sector thus accounts for only a small fraction, about 1 percent, of Libya’s total labour force. To put this into perspective, in a national economy heavily dominated by the hydrocarbon sector, the entire agriculture sector itself contributes only an estimated 6 percent of total GDP. Gaddafi’s attempt to create an independent industrial base was as unsuccessful as his pursuit of a self-sufficient agricultural sector, so the focus shifted to an independent industry. The sector consisted mainly of industries closely connected with the oil industry, such as steel, iron, and aluminium. The Libyan Iron and Steel Company, which was started in 1979, was heavily subsidized and became one of the largest companies in Libya and one of the largest iron and steelmakers in North Africa. Its iron ore is largely imported, although there are large reserves of iron ore in southern Libya. Gaddafi was unable to exploit these because no foreign investors were interested. Smelting power comes from local natural gas. On this basis it was, by the mid 2000s, making a substantial profit, but Libya’s limited market and Europe’s protective regulations created overcapacity. Agriculture contributes 3.6 percent of GDP, industry (mainly the hydrocarbon sector) 56.7 percent, and services 39.7 percent (CIA World Factbook). 17 percent of the labour force works in agriculture, 23 percent in industry, and 59 percent in services. The main products of the industrial sector are petroleum, petrochemicals, aluminium, iron and steel, processed foods, textiles, handicrafts, and cement. In the late 1970s, the regime accelerated implementation of the socialist policies outlined in the second part of the Green Book. Gaddafi described a sort of popular capitalism in which the people were shareholders and rejected private entrepreneurship, as the masses would not benefit from revenues. The core economic ideology was reflected in three slogans: ‘The occupier of the house is the owner’, ‘No wage workers but partners’, and ‘Trade is exploitation’. In 1978, property was redistributed. Owners had to choose one house for themselves, and the rest of their real estate was allocated or appropriated. It was forbidden to demand rent. This brought the construction sector to a standstill, but almost every Libyan was provided with housing. The same year marked the beginning of a campaign to place the means of production under systems of worker self-management. In May 1980 the currency system was virtually entirely demonetized, with a deliberately redistributive purpose. In early 1981 the state took over all import-export and distributive functions. Almost all private shops were replaced by huge state-run supermarkets. Only carpet weavers and shoemakers were exempted; disgruntled ex-retailers joined the ranks of Gaddafi’s opponents. Per capita GDP fell from USD 10,261 in 1981 to USD 5,646 in 1987. A further blow came with the sanctions imposed by the United Nations and US in 1992, which inflicted severe damage on Libya’s economy. International air traffic was banned, as was the sale of weapons and parts for aircraft. All Libyan assets were frozen, except those required for oil transactions. The US sanctions enacted in 1986 forced US oil companies to cease operations. Economic growth between 1992 and 1999 was 0.8 percent per year. 1993 and 1994 witnessed a negative growth of 7 percent per year, leading to massive layoffs among workers and price rises. Per capita GDP, which had climbed back up in the late 1980s, immediately fell again, from USD 7,982 in 1992 to 5,864 in 1995 and 5,951 in 1998. The Libyan government estimated it missed out on more than USD 30 billion in revenues and production capacity. Quite apart from the damage caused by the sanctions, the crisis was magnified by the structural problems, poor functioning, and bad management by the regime. Dilapidated factories and other buildings and poorly maintained roads were common. The response was to allow a limited return of private enterprise, beginning in 1992. As in former communist countries, a group of traders became rich from scratch in a few years. In 1996, the government set up purification committees to combat excesses. Supermarkets filled with imported goods were closed and shop owners imprisoned, but the importation of food slowly returned to private hands, and this process accelerated in the 2000s. The wholesale move to a free-market economy was planned to be finished on the fiftieth anniversary of Gaddafi’s revolution, in 2019. Libya aimed to become a centre of trade between Europe, Africa, and the Caspian Sea countries. 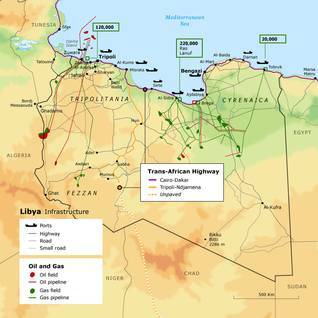 Libya proclaimed itself the Gateway to Africa, and a free port in Misrata supported that goal. But Libya had a long road ahead in liberalizing its socialist-oriented economy. Before the 2011 revolt, the importation of food moved increasingly to private importers. Legislation for a private sector was slowly enforced. Libyans were promised they could reclaim ‘lost’ property. A construction boom took place. Providing infrastructure in Libya has always faced the enormous problem of providing for a small population over vast distances. The Gaddafi period added a second problem – how to provide an infrastructure that would underpin ideologically-driven development. His various attempts to decentralize the government by moving departments to other regions are an example of this, along with abortive attempts to create alternate centres of administration. In 1987, apparently as an attempt to restructure completely a recalcitrant bureaucracy, Gaddafi declared that a new capital would be set up in Jufra. The project soon vanished, but the following year attention turned to Sirte, once the nearest village to Gaddafi’s place of birth. This became the focus of a huge public-works programme to turn it into a city, as government departments and the Libyan Parliament were relocated there, although Tripoli remained the legal capital of the country. After the end of sanctions, more money was put into infrastructure generally, but, even then, government expenditure was modest – in 2006 about USD 5.3 billion was allocated to infrastructure expenditure, including housing, water, and roads. Of this transportation, telecommunications, and storage accounted for USD 225 billion. Libya’s historic caravan routes are now asphalted. The trunk of the road system is the main route from Tunisia along the coast to Egypt, linking Tripoli and Benghazi, and a north-south route to Sabha and Murzuq. The extreme distances in a harsh climate demand constant upkeep, which was not provided during the sanctions period, when the long-distance road network deteriorated. In 2000 there were 83,300 kilometres of roads, of which 57 percent was paved. When sanctions were lifted, the Gaddafi regime concentrated on increasing the quantity and quality of the infrastructure. By 2012 paved roads totalled than 57,000 kilometres of a total network of, 100,000 kilometres. In 2007 there were 290 motor vehicles registered for every 1,000 people, of which 225 were cars. 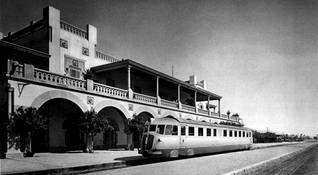 Libya is the only country in the Maghreb without a railway network. Lines built for military purposes during the Italian colonization have long been disused. As early as 1977, the Libyan National Atlas showed plans for a rail network along the Mediterranean coast, linking Tunisia and Egypt, with a line south to Sabha, but it was never constructed. In the final years of the Gaddafi regime, a project to build a 3,170-kilometre national rail network was begun. The scheme, costed at USD 12 billion, was divided between Russian Railways, which was to build a line between Sirte and Benghazi, and the China Railway Construction Corporation, which was given a contract in 2008 to build 352 kilometres of coastal railway from Khomsto Sirte and later another 172 kilometres from Tripoli to Ras Ajdir, on the Tunisian border, and an 800-kilometre line between Misrata and Wadi al-Shati, near Sabha, an area rich in iron ore.
Before the revolution, some work had started, and rolling stock was delivered for the Benghazi-Sirte line. This stopped during the civil war, but in February 2013 the General National Congress announced that the project would be restarted, under new management. Libya has 144 airports, 64 with paved runways and 80 with unpaved runways. Main airports are in Tripoli, Benghazi, Tobruk, Sirte, Brega, Sabha, Ghat, Ghadames, and Kufra. There are other military airports. Before the 2011 revolution, the national airline was Libyan Arab Airlines (LAA), founded as Kingdom of Libya Airlines in 1965. In the 1970s LAA built up a fleet of planes sourced in the US (mainly Boeings) to service an extensive network linking Libya with Europe, the Middle East, and South Asia. The imposition of sanctions in 1992 included both the delivery of new aircraft and landing and overflight rights in other countries. All international flights ended, and LAA, confined to domestic routes, was unable to buy spare parts for its fleet. It purchased some Soviet-built aircraft to replace them until sanctions were lifted. 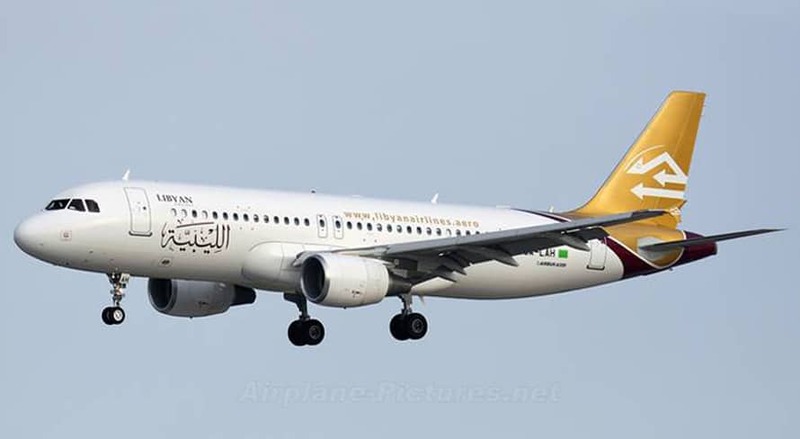 When sanctions were lifted, Libyan Arab Airlines began to rebuild its international network and ordered new aircraft from Airbus and other companies. In 2001 two new airlines began operations. The first was a second state-owned company, Afriqiyah Airways, which was set up in partnership with an Italian airline, Blue Panorama. It relies almost exclusively on Airbus aircraft which it uses on routes in Africa and the Middle East and a few European destinations. The other was the first privately owned airline, Buraq Air Transport, in which Gaddafi’s wife Safia had a large holding. It served domestic airports and a few in the Middle East. After the war, it opened routes to Tunisia and Morocco. In 2010, 2,430,996 passengers transited through Libyan airports. In 2011 this number fell to 1,895,908. Freight in 2010 was 300,000 tonnes. Because it is situated on a major sea lane through the Mediterranean, Libya’s long coastline potentially serves the country itself and as a hub linking the Mediterranean and sub-Saharan Africa. That was also the historical pattern of its relationship with the sea. 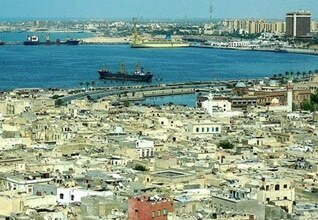 Libya formerly lacked good harbours. For decades Tobruk and Tripoli were the only deep-sea ports. In the late 1960s, Libyan ports were so clogged that Tunisian ports had to be used and products transported overland to Libya. Libya’s non-oil trade can be measured by its seaborne container traffic, in twenty-foot equivalent units (TEUs), the standard-sized container. Container traffic in Libya was 122,122 TEUs in 2007 (the first year for which data are available) and 184,585 TEUs in 2010. There are now 18 commercial ports along the 2000-kilometre coast of Libya. Not many of these handle all types of cargo: specific ports for the oil and industrial sectors serve those industries. The principal ports are Benghazi, Misrata, Khoms, and Tripoli; they handle most of the international trade. Zuwara, Sirte, Tobruk, and Derna are secondary ports. Two ports (Brega and Ras Lanuf) handle both petroleum and its derivatives and containerized cargo. The ports of Hariga (near Tobruk), Zuwetina, Brega, Ras Lanuf, Sidra, Zawiya and Mellita, and Abu Kammash handle petroleum and petroleum products. The port at Abu Kammash serves only the petrochemicals complex there. The only passenger port terminal is in Tripoli, though Benghazi and Dernacan both receive passenger ships. 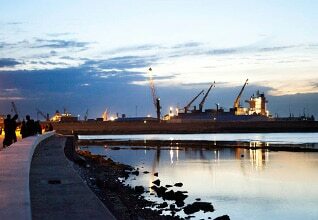 The most modern port before the 2011 revolution was Misrata, which, in addition to handling iron ore and grain (storage capacity 40,000 tonnes), was the largest handler of container traffic (64,712 containers in 2007) and had the largest number of maritime arrivals (959 vessels in 2008). In 2006 it was declared a free port, and on the eve of the 2011 revolution it was the only Libyan port working 24 hours a day. 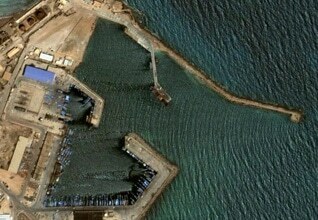 The main fishing port is Zliten. 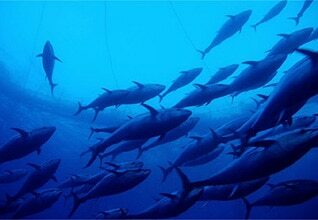 The fisheries sector is underdeveloped, although local waters contain large quantities of tuna and sardines. In 2007 Libya had one tuna canning factory and two for sardines. The Central Bank of Libya was established in 1956. For most of the Gaddafi period, it oversaw an almost exclusively state-owned banking system. Private-sector banking was re‐established in 1993 but did very little. More active privatization efforts began in 2007. BNP Paribas acquired a 19-percent stake in Sahara Bank, with plans to purchase up to 51 percent by 2012. In early 2008, Arab Bank acquired Wahda Bank, with a similar timeline towards a controlling ownership. When the rising against Gaddafi began, BNP pulled out all its staff, and they had still not returned by May 2013. 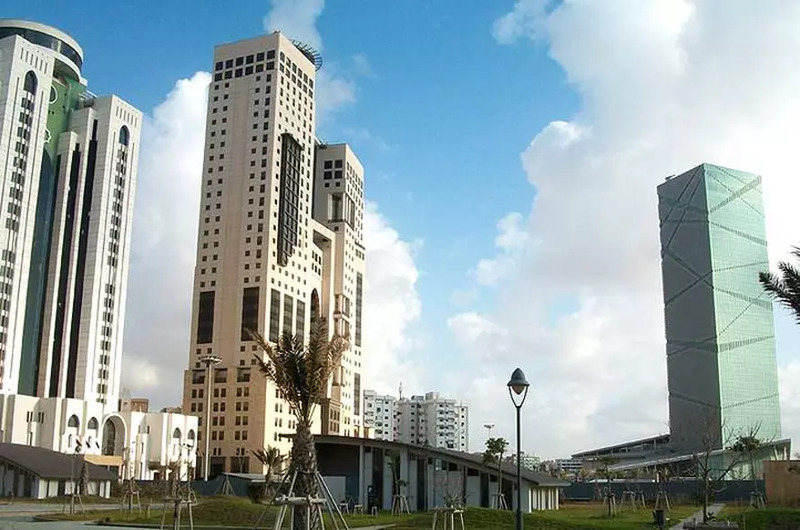 Almost immediately after the establishment of the TNC in Benghazi in 2011, it set up its own Central Bank (CBL) to administer financial affairs until Tripoli itself was occupied. In March 2011 the UN Security Council froze Libya’s foreign holdings. Gaddafi’s governor of the CBL, Farhat Omar Bengdara, resigned in March 2011, and the TNC appointed Sadeq al-Kabir to succeed him. In December Libyan foreign holdings were unfrozen. In January 2012 the CBL started withdrawing the old currency in order to restore liquidity in the country’s banking system, because the vast majority of funds were held outside banks. On 6 January 2013, the General National Congress passed a law that introduced Islamic banking and banned interest on financial transactions, giving banks two years to become fully Sharia compliant. In July 2013 al-Kabir was sacked, for unexplained reasons but perhaps because he had worked under the Gaddafi regime. Libya’s stock exchange was established in 2006. In 2007 it signed a training agreement with the London Stock Exchange. It closed in February 2011 and reopened in March 2012, listing the shares of 12 companies, mostly banks and the exchange itself, with a total market capitalization of USD 3 billion. In July 2013 the exchange signed an agreement [with whom?] to expand the role of Islamic finance in the Libyan economy. For years, Libya was difficult of access, but in the late 2000s the Gaddafi regime began planning to attract foreign investors in tourism. The General Tourism Authority’s budget for improvement of facilities in 2007 was USD 70 million. 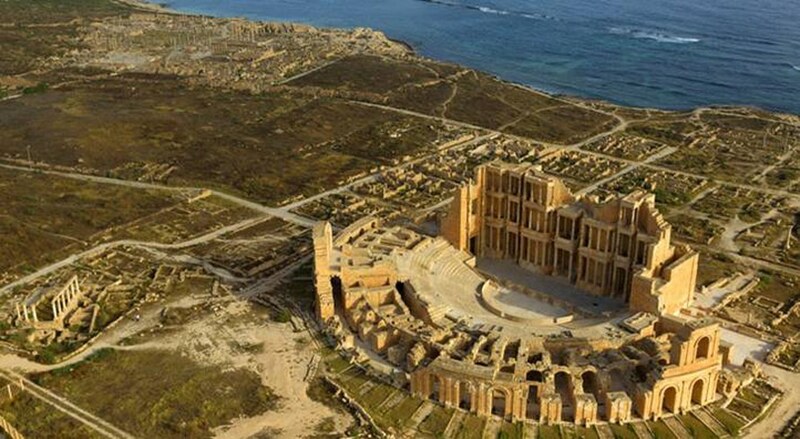 In 2008 there were 34,000 tourist arrivals in Libya (World Bank) between 250,000 and 320,000 tourists visited Libya, contributing 0.2 percent of export earning two-thirds of its visitors were European. In 2005, there were 125,000 hotel beds available, which is to be expanded. The Maltese-Libyan Corinthia Bab Africa Hotel in Tripoli is the country’s only five-star hotel. Libya has much to offer tourists. The country is home to five World Heritage Sites (see Nature reserves; Greeks and Romans). In 2010 Libya’s exports totalled USD 46.8 billion. This dropped to USD 19.1 billion in the revolutionary year of 2011 but climbed again in 2012. The International Monetary Fund (IMF) estimated in 2013 that exports were USD 62.2 billion in 2012 and projected USD 64.6 billion and USD 62.5 billion in 2013 and 2014 respectively (IMF Chapter IV Consultation on Libya 2013). Main export commodities are crude oil, refined petroleum products, natural gas, and chemicals. Main export partners in 2011 were Italy (22.8 percent), Germany (14.3 percent), France (14.2 percent), China (10.7 percent), Spain (5.2 percent), and Tunisia (4.8 percent) (Index Mundi). 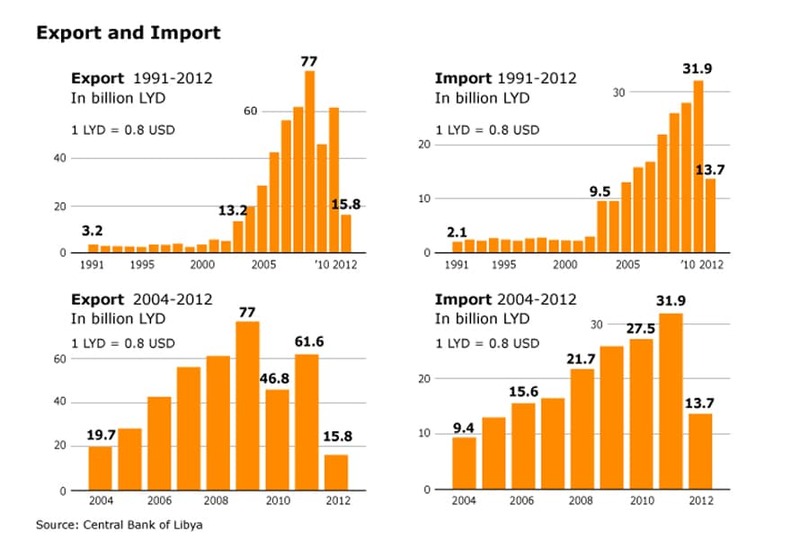 In 2010 Libya’s imports totalled USD 24.6 billion. This dropped to USD 11.2 billion in the revolutionary year of 2011 but climbed again in 2012. The IMF estimated in 2013 that exports were USD 25.7 billion in 2012 and projected USD 30.5 billion and USD 34.2 billion in 2013 and 2014 respectively (IMF Chapter IV Consultation on Libya 2013). Main import commodities are machinery, semi-finished goods, food, transport equipment, and consumer products. Main import partners in 2011 were Tunisia (13.3 percent), Turkey (9.1 percent), China (8.8 percent), Italy (8.4 percent), Egypt (6.7 percent), Syria (5.2 percent), France (4.9 percent), and Germany (4.8 percent) (Index Mundi). In 1989 a treaty between Libya, Tunisia, Algeria, Morocco, and Mauritania established a trading bloc, the Union du Maghrib Arabe (UMA), that was supposed to establish a common market between those countries by 2000. This has not happened, and intra-Maghreb trade is insignificant. In 2000 trade between the UMA countries represented 2.25 percent of the combined international trade of all the member states. In 2006 the figure was 2.01 percent (UMA). In July 2013, when Libya and Morocco signed a partnership and cooperation agreement that was aimed at strengthening trade, trade between the two countries fell from USD 148 million in 1999 to USD 60 million in 2011. Libya applied in 2004 for membership in the World Trade Organization (WTO), and it holds observer-government status. The informal sector, usually easily visible in Arab countries, is less visible in Libya. State control removed the street vendors of vegetables, fruits, and newspapers that are common in most Arab cities, but by the end of the Gaddafi period, the informal sector grew to an estimated 30 percent of the economy. During the revolution, it came to dominate economic activity, according to a 2013 report of the African Development Bank. The International Monetary Fund (IMF) noted in the same year that the informal financial sector operated beyond regulatory and supervisory reach and that it ‘undermines public policy and potentially increases risks to financial stability and macroeconomic performance’ (IMF Chapter IV Consultation on Libya 2013). In particular, informal systems of international transfer of funds were centred in the Tripoli gold souk (market) in 2013. Smuggling has grown since the 2011 revolution, and human trafficking existed in the Gaddafi era. By 2012 trafficking networks to sub-Saharan states had returned. These networks smuggled migrants to Europe, but the difficulty of doing this after the revolution meant that many trafficked people remained in Libya for extended periods. Forced manual labour of men and forced prostitution of women were common results.